Some kind soul that still has Blades of Heaven could give me a link? I've been looking everywhere for the entire day and no luck. I really appreciate the efforts of everyone contributing to this thread. If there was one thing I would like to know beforehand, it would be whether a game is complete or just a demo version (since I only play completed games). Of course, it would be a pain to find out the status of every game and add it to this list, but I think this information would be the one addition this thread could profit the most from. Hey all, really amazing to see this project still going. The last time I looked at this was in 2012. Not sure if they're rare or obscure but I found 4 of the RPGLand.net game demos: Ed's Decision, Morellum Factor, Birds of Freedom and Tales of Urodora. Here's the links in case they're suitable for this thread. In terms of requests, I'm currently trying to hunt down The Benevrin/Unvoiced Sympathy. It was known as Unvoiced Sympathy as the demo and was hosted on Crankeye.com, and was later finished and released as The Benevrin. I miraculously got in touch with the creator after 12 years, and hopefully they have a backup of either or both, but we'll see how that goes. I'd also put the name Skiz's Path out there, if anybody remembers that. I'm currently trying to access an old hard drive that may have some goodies on it, as well. I'm not getting my hopes up though. Finally, it'd be good if there were mirrors of all the uploads. Considering what happened to hosting services like Savefile and Megaupload we never know when Mediafire might drop out on us. Hi everyone, I was trying to find a game, which I think was made in RM 2k, but I don't have the name. I'm just trying my luck here, since there was only a smallish demo. So it went like this: The hero was a sort of student living in a small island, and his name was Duane or Durane, not sure. He started class, and some professor tested him on battle. After that, for some reason, he needed to go to a forest, where he, among other things, I think found a small gemstone, sort of like a magicite. From there, I think he arrived on a beach and he followed some... dark elf of sorts. I think that's where the demo ended. The game was fun, and I'd love to see if a complete game exists, or just download that demo. The other only relevant detail I remember, was that upon critical hit, the message was "There's blood!". Yeah, I know, it's not much. Alright. There are a couple of different ways to do this. Most people don't have as complicated of a setup as I do. So, most people maybe can do something simpler. 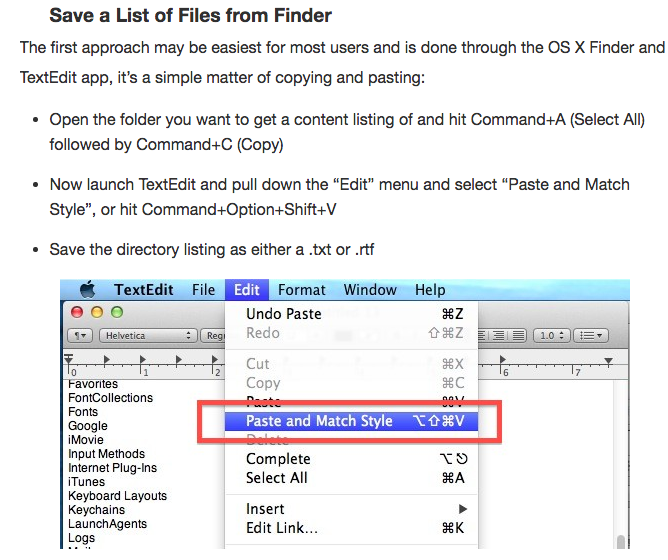 Under Keyboard Shortcuts, click: "New Terminal at Folder"
Once Terminal is open type "ls>game-list.text"
But yeah I would like to add this under the "How you can help" section of this topic; in fact I'd like to revise it so I could include more info on how you guys can help. On my spare time, i've often looked for other rpgmaker communities of different languages and came across. condadobravehart, awhile back - So this is very much appreciated, I'll be sure add everything you've contributed as soon as I get the chance. and on Oniromancie (french rpgmaker community) and RPG-Atelier's (german rpgmaker community) they have also archived games of various languages as well, so it's not unusual to carry notable rpgmaker games of different languages. 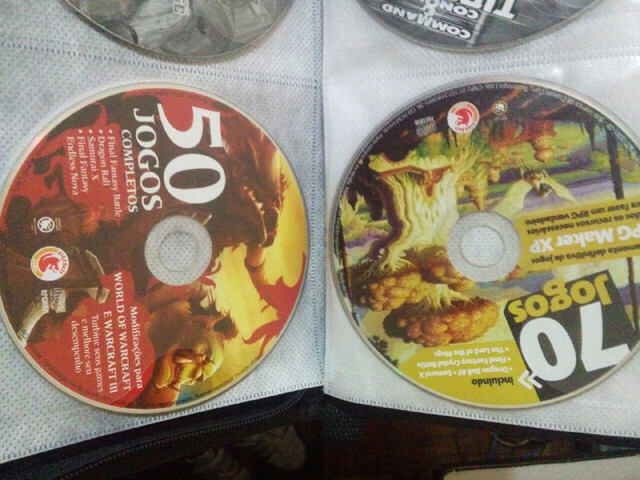 I believe that we should also store these games alongside some in-game screens since often times people do remember the game, but not always they remember their name. I agree, I've thought about adding images as well (in fact the GGZ games have pictures). But I have to agree with what Darken has mentioned in the past here; RMN's bbcode is just too cumbersome to work with here on the forums for one person - even just updating each individual entry that's already here, is a lot of work. What I originally wanted to do was - whenever a user placed their mouse over a download link, a screenshot of the game would pop up,(similar to newground's flash movie portal):so they can see what the game looked like before downloading it. Right now, I'm not quite sure how to do this, or even if RMN's forum/bbs code allow for display image on link hover. 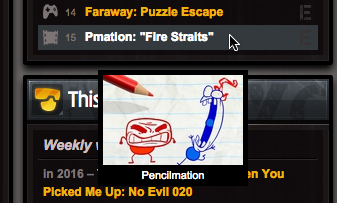 But I would like to incorporate screenshots into the list, in some form, later on - just not here on RMN's forum. - it's just too much work for one person to continually manage and update alone. But If you can give me a screenshot, I will gladly add it to the archive. 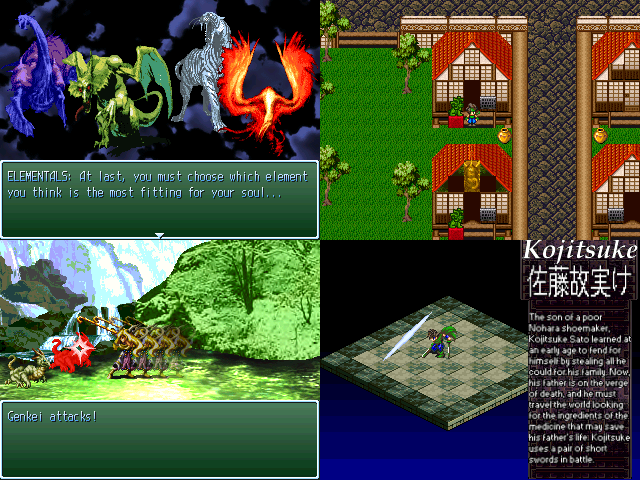 As I mention before, The GGZ games already have pictures for each game, so this is definitely something we should be doing already: Providing images for rpgmaker games is going to take a lot of work though - not only do you need to take screenshots, but you have to actually play through these games, in order to get those screen shots as well. But yeah, what I'm trying to say is, if you guys really want pictures added to the archive, we'll need your help with this. because it's gonna take a lot of work, to get screenshots, for every single rpgmaker game that gets added to the archive. So we strongly encourage everyone to help out where they can, even if it's just small things, like helping to determining if a game is complete or a demo or providing screenshots for old games that don't have any. Update: So I just received some bad news, unfortunately things are going to be very slow for an undisclosed amount of time on my end. But I'm still going to keep updating the master list, but as I mentioned before it's going to be very slow - But as this is going on I would like to get started on the torrent Darken and I spoke about. So I would like to stick to something that's easy for him to use and manage, but also something everyone could very easily identify with and add to his work as well. Which is similar to what TGA has them listed under the gamingw list. Which is what it'll also look like on the torrent, while the actual .exe, or zip file will remain the same. EDIT: Also, the problem with games that require RTP: Games such as Don Miguel's Adventure (the sample RM2000 game) and DOOM's 5 require RTP in order to run. Would you guys like for me to convert these game, so they can run without rpgmaker installed? Beyond the torrent, I'm hoping this project to archive rpgmaker games will eventually be in a form that's self sufficient but also sustainable, so that everyone can contribute to it - long after our involvement. So yeah, I apologize in advance for my absence, life is just sort of getting in the way at the moment, rest assured though, I am reading your responses and taking them into consideration. (in fact it's faster if I don't reply and just continue to make quiet changes to the topic) But I just want to assure you guys that your requests are being heard and I'm eternal grateful for all your contributions and suggestions. But other than that, I believe that BBCode is not gonna help us much. There may be some FTP alternatives like TGA mentioned. Indeed, TGA also mentioned something about this in this post. Well, the filing system could be done in a lot of ways, we could for example use some database to make not only filing but also classifying and searching easier, then it could turn out into something like VNDB, or perhaps something more simple like a Wikia page. If we could make something simple that allowed users to upload and classify the games that would be great. I think it`s a good idea although it`s not top priority right now to do this. Besides, you are already busy and this might take you awhile to accomplish. should I add these games into the main list/torrent, right now, as is (unfixed/unplayable)? or should I fix them so they don't require RTP and then add them to the torrent? I was able to fix them and get them running without RTP yesterday, so they're playable now and ready to be added - …but there are probably some people out there who prefer to not have these RTP files included, incase there's an issue down the road. So yeah. that's why I'm asking. Like, SegNin was known to take pieces from several different games to create a standalone working version - but I just want to know if this is still cool with everyone before going ahead with it. You made some really cool suggestions here anyon175, ❤ - rpgmaker already has a wikia actually, but unfortunately it's been abandoned for quite sometime - but I would love something like VNDB for rpgmaker games. - but I'll have to touch upon this at a later time. Once the torrent and mirror are out of the way, I'll start thinking about web hosting for you guys, just to see where we go with this. 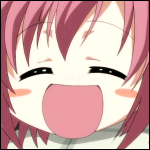 But yeah, please continue to let me know, what you guys think of the filing system and standalone rpgmaker games. I wanna quickly get the torrent and filing system stuff out of the way first, so we at least have something stable, before moving onto the next thing. I see... I aprove the idea, I believe the benefits of playing without the RTPe for people without the package are greater than making then download them. Perhaps we should do it before adding the games to the torrent after all. Indeed... Could you imagine a RMDB? Does anyone have The Mirror Lied? The download link on the gamepage no longer works because it was hosted outside of RMN and Reives last posted in 2011. If the rpgmaker game has a "top games especial installer", you'll want to install/extract the rpgmaker game first and then throw it into a winrar, before uploading it to MediaFire, otherwise when you go to upload the game to MediaFire as a winrar, It'll come up as a DMCA Takedown Notice and only upload 20b of the file. 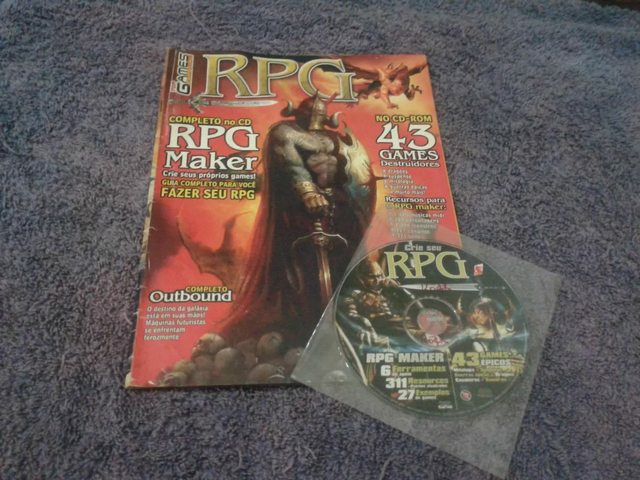 Like many Computer Gaming Magazines of the early 2000 they would often offer demo discs available for download to go along with their magazines. ...So this is "Top Games Especial" way of combating Copyright Infringement, which is totally understandable, but from I hear, supposedly, TopGamesEspecial is no longer even in publication, so it should be safe to extract these games from their original installers and upload them to mediafire for preservation; also the Installer has this annoying habit of installing games directly to the C: drive. I'm gonna try and see if I can get a copy of the magazine myself. But it's pretty neat to find out that a magazine, is now is sort responsible for preserving a handful of these games. Wow, what a weird discovery to make at 3:00 AM. EDIT: I'll have to think about this for a bit. Like, It's really cool to see games like Badluck's "Tarion Star: Call of the Blade" show up in this magazine that no longer exists - But then again it's just an installer. ....Eitherway, for now I'm gonna just file them and upload them to the archive. Indeed... I happen to have some of these old discs in my possession. The magazines however have been (mostly) lost. Quite surprising to see it over here at RMN. 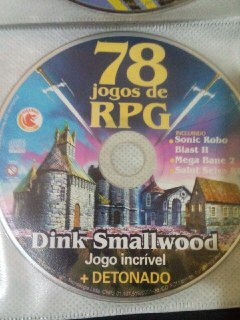 ...Oh and the link with the games you mentioned is not actually from the same disc in the photo. It's from a different disc with 70 games that came some years later. RM2Kémon - Gotta catch all! 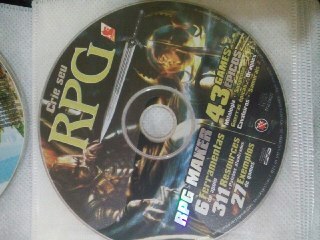 Note: These discs may contain other games that weren't made with the RPG Maker engine. Some of these also are not RPGs. Note2: There are games with weird title names because they were originally mistyped/incorrectly named inside the discs themselves. Some kind of weird LGBT neopagan Final Fantasy knockoff. Apart from a TV Tropes page, there's basically nothing on the internet about it. 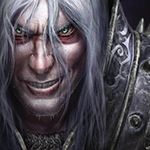 An infamously terrible troll game (trailer is NSFW). Apparently not even the creator has a copy anymore. EDIT: Also, thanks anyon175 ❤! I wanna touch upon this more when I have the chance. I think it's wild that games like Demon Legacy showed up in these magazine.